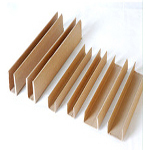 Bharath paper conversions is one of the prominent manufacturer and exporter of u-shape edge protectors located in india. u-shape edge protectors are a simple product that solve a wide range of packaging problems, our u-shape edge protectors are the smart choice as they provide much protection as per the customerneed. Our u-shape edge protectors are built to the highest standard of quality and we provide the same at the most reasonable price.